On July 1, 2017, exactly 20 years to the day that Agi began her crusade to lead the fight against pancreatic cancer, she shared a letter written to the soon-to-be Chair of our Scientific Advisory Board. Her message was clear and decisive – families could no longer wait for much needed critical research and she was prepared to do everything in her power to make that happen. Families like hers, who have been deeply impacted by pancreatic cancer, would continue to have an advocate dedicated to finding answers. 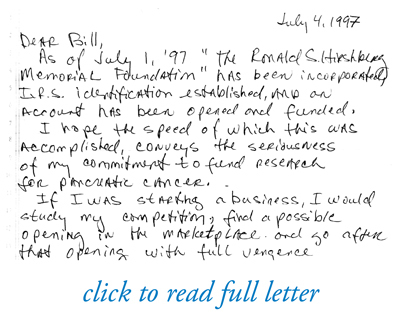 The relevancy of this letter, whether read in 1997 or today, is significant in the history of the Foundation. It expresses our determination to fight on behalf of every family who has been affected by pancreatic cancer. There are countless reasons why each of us have committed to see this fight through, whether it’s on behalf of a loved one, because we don’t want to see other families suffer, or because we want to live in a world that is cancer free. This letter shows both where our journey began and how far we’ve come, but more importantly, it demonstrates our commitment to continue to fight – until there is a cure. To learn more about our history, mission and our commitment to never give up, please watch and share our new 20th Anniversary Video. Then join us. Help us continue our relentless pursuit of effective treatments, prolonged life and a cure. When we first set out on this extraordinary journey to fight pancreatic cancer, we made a promise that still holds true; we would be relentless and we would never give up! For 20 years we’ve kept that promise thanks to families, friends, survivors and those whose lives have been touched by pancreatic cancer. They are never giving up! Here are their stories.